Second Chance Prison Ministry, Inc. Welcome to Second Chance Prison Ministry, Inc.! "In 1980 God changed my life. He saved me, He delivered me from fear, and He healed my body. I then made a promise to God that I would go where He sent me and would do what He showed me to do. 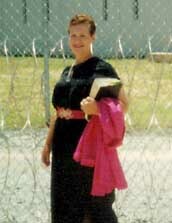 I never expected to do prison ministry... since He delivered me from my prison of sin, sickness, fear, and rejection... He knew I would lead other's to Him. I had never been in prison, buy I had experienced the same emotions... I carried my prison around with me." "Nothing is impossible with God. If the Word of God changed my life it can change other's also." "Save the lost... at any cost."